Variations of the genome editor CRISPR have wowed biology labs around the world over the past few years because they can precisely change single DNA bases, promising deft repairs for genetic diseases and improvements in crop and livestock genomes. But such “base editors” can have a serious weakness. A pair of studies published online in Science this week shows that one kind of base editor causes many unwanted—and potentially dangerous—“off-target” genetic changes. In its original form, CRISPR uses an RNA strand to guide an enzyme known as Cas9 to a specific place in a genome. The Cas9 acts as a molecular scissors on the DNA, cutting both of its strands, and the cell’s attempts to repair the brake can disable the gene. Or researchers can use the cut to insert a new sequence of DNA. Base editors instead couple the guide RNA to a Cas9 that only cuts one DNA strand. This molecular complex also includes an enzyme, called a deaminase, that can chemically change one base into another. Because such editors have more control over the specific changes than CRISPR itself, researchers did not expect them to cause off-target errors. 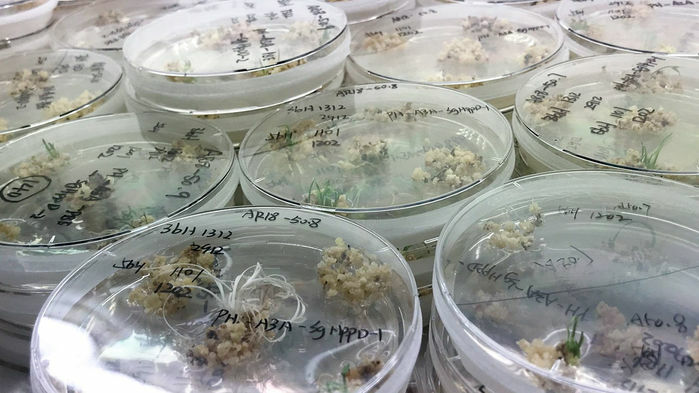 Now, two groups of researchers mainly based in China, working independently on rice and on mouse embryos, have discovered abundant off-target mutations in experiments that used an editor that changes the DNA base cytosine to thymine. A second base editor, also from Liu’s team, that converts adenine to guanine introduced no such mistakes. In that work, a multi-institution collaboration led by researchers from CAS in Shanghai and Stanford University in Palo Alto, California, developed a clever built-in control by injecting a base editor into only one of two cells in a newly formed mouse embryo. Comparing the progeny of these two cells, researchers found the off-target effects created by the cytosine base editor were more than 20 times more common than the background mutation rate. Some of the mutations occurred in genomic regions that play a role in cancer. Tweaking that editor’s deaminase or other components could decrease its off-target effects, says J. Keith Joung, a pathologist at Massachusetts General Hospital in Boston who invented a popular cytosine base editor and co-founded both a biomedical and an agricultural base editor company with Liu. Kim is optimistic that the field will promptly figure out solutions for the cytosine editors. “A new problem always provides new opportunities,” he says.